English rave / techno band formed in 1989 by Nigel Champion & Mark Franklin. Their early material was highly influential in the UK rave scene, with many bands inspired by their sound & live performance. Republica vocalist Saffron started her career by performing live with the band, but she recorded no material with them. The band is mainly remembered for the piano track "Anthem" from that period. 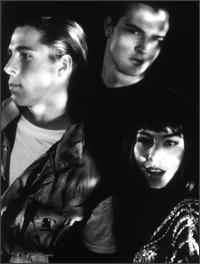 They released the LP "Inside Out" in 1995, by which time the band had developed a more refined progressive house sound. Unfortunately, they were dropped by deConstruction just prior to the album's release. N-Joi were the pioneers of 1991 Techno sound, their music was almost parallel to Belgian 91'ish Techno music, even though they were from UK, with tracks like Malfunction, Adrenalin, Mindflux, The Kraken, Phoenix, Manic. I cannot think other artist from UK that capture so much the european 1991 techno sound like N-Joi with bleeps, bass, breaks, stabs and 4/4 rhythm alltogether to a result of hands in the air energetic hard techno rave music. Sadly they never released some of the tracks of ''Live In Manchester parts1&2'' properly into singles, or maybe some other of their demo tracks of that period that we will never hear. I wish they had done more techno music and releases during 1990-1992, than they did. That would have been cool. One of my legends ever. In my opinion N-Joi were the best band of this era, even today their music sounds different, but not dated. They are certainly the only band I regret not seeing when I had the chance. It's a shame they will probably be know to most people for Anthem, which is not one of their best tracks IMO. From a time when underground music was pushing boundaries, their music was consistently different and well produced. They were able to fuse breakbeat, sub-bass, beeps, acid lines, rave stabs, odd lead sounds, and looped samples all under pinned by a solid 4 to the floor 909 kick drum. They were innovators, and sadly never achieved the highs they were capable of.